Ubuntu Tweak is every newbie Ubuntu user's closest companion and we have already seen how Ubuntu Tweak is slowly evolving into one among the must have installation candidates for Ubuntu in our Ubuntu Tweak review. And with the new mockup UI, the next phase of development for Ubuntu Tweak has only started. There will be a new toolbar to switch between main category of functions, and the sub-functions will locate at the right-sidebar. The current welcome page will be replaced by a window showing different statistics of your Ubuntu desktop. 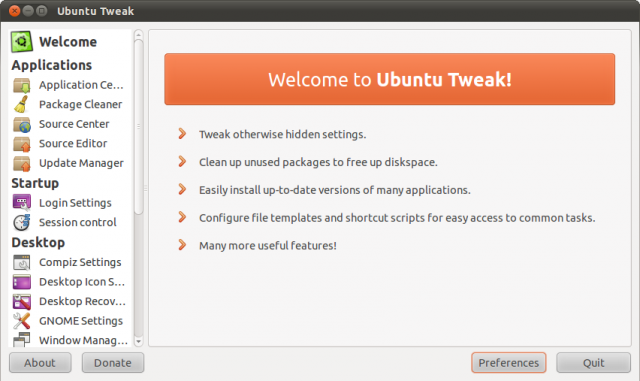 What's New in Ubuntu Tweak 0.5.7? Now has a new theme which integrates seamlessly with the default Ubuntu theme. Add option to set Terminal menubar. Removed "Auto Start Programs", since it is a duplicate feature of GNOME Session application. A lot of PPAs has been added and updated for Ubuntu 10.10 including the ones like Hotot Twitter Client. 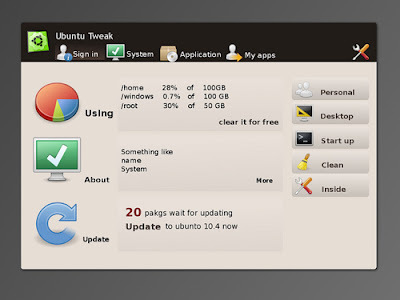 Ubuntu Tweak 0.5.7 can be downloaded from here.